This is an extract from my Doctoral thesis, which was recently granted by the University of New South Wales. If you’re interested in reading the full version (warning: it’s 107,000 words), just click on the image below to be taken to a PDF. 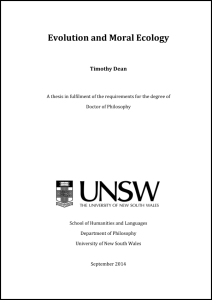 Click here for a full PDF of the thesis. Moral diversity is often dismissed as being something to explain away en route to discovering the correct answers to moral questions, particularly by those who adopt a realist metaethical perspective. In this thesis I argue that moral diversity is actually far more interesting than this perspective might suggest, and that understanding the causes and dynamics of moral diversity can tell us something about the nature of morality itself. I draw on the tools of evolutionary biology, game theory and moral psychology to give an account of the existence and variation of moral and norms, and how they change over time. I argue that morality can be seen as a kind of cultural technology, the function of which is to help solve the problems of social living in order to facilitate prosocial and cooperative behaviour. However, the optimal solutions to the problems of social living depend on the state of the physical and social environments in which those solutions operate. As such, few, if any, norms or attitudes optimally satisfy the function of morality in every environment. Furthermore, the existence of other norms or attitudes within an environment effectively alters that environment such as to impact the success of other norms and attitudes, introducing another element of dynamism to moral systems. I also argue that these dynamics have influenced the evolution of our moral psychology, introducing another source of diversity into moral attitudes. This picture of morality suggests that moral diversity is not just an artefact of ignorance, error or bias but is a by-product of the inherent complexity of social living in a wide range of physical and social environments.